the pan. Any help is greatly appreciated. Is this a modern made pistol or an antique? Can you post a photo of the pistol? In order to have even a general idea of what you have a photo will be necessary. Even a complete written description is not enough. Lots of old pistols are completely unmarked. Others, especially military pistols, will have proof marks, inspectors' marks, rack numbers, etc. to help you identify the piece. Proof marks are found on the breech end of the barrel, usually on top. Inspectors' marks can be anywhere and are most often found on wooden stocks. Manufacturers' and armories' names are found on lock plates. Some times there are markings on the underside of barrels, which are hidden by the stock. Removing a barrel to look for markings can result in damage to the stock on old pistols which are not well preserved. Conversions from flint to percussion locks were not uncommon at all. If it was originally a flintlock then it may have been made prior to 1830. But, without a photo it is difficult to say. Check back in when you have that picture. The gist: when posting, simply "browse..." to your file and then "Add Attachment". Repeat. That helps but not very much. We need clearer photos so if you can get some please post them. I think you have a civilian pistol, probably a converted flintlock. The lock plate appears to be too large for a pistol, notice how it almost meets the escutcheon for the barrel key. 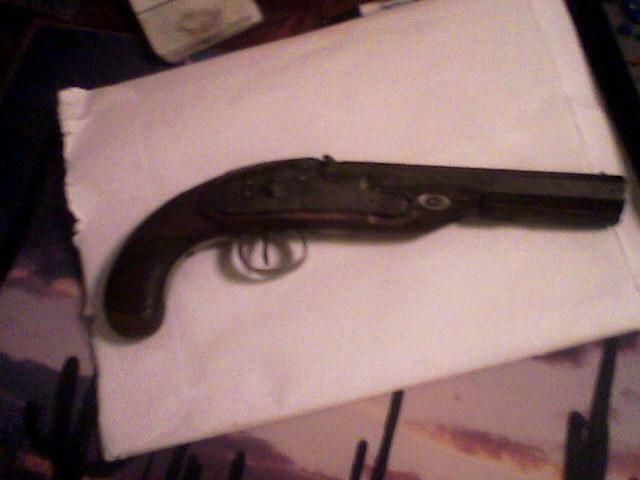 (Now that I look at the obverse side of the pistol, the molding there is about the same size as it is on the lock side. That is still a large lock for a pistol) It may be a replacement. There was a nose cap on the pistol at one point. The trigger guard finial and the half stock make me think this is possibly an English gun dating from the early 19th century. The nose cap is missing and was probably brass or perhaps poured pewter. The markings you describe are not familiar. With better photos I might be able to tell you more. Keep in mind that there were hundreds, perhaps thousands of gun makers in the early 19th c. not all of whom are documented anywhere. We may never know who made it. 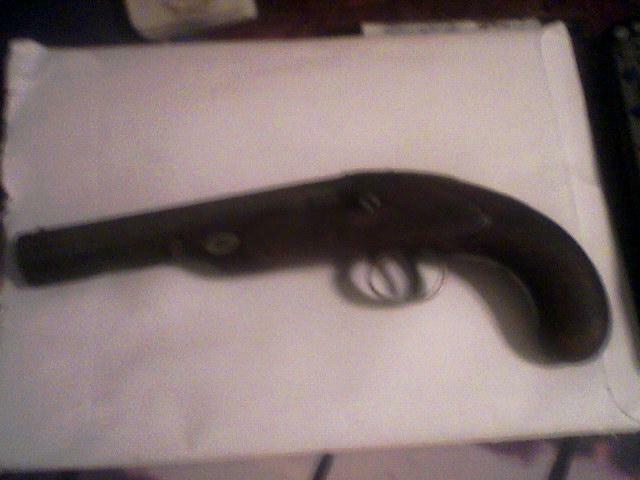 (I have added a photo of a replica KY pistol that looks a little like yours. Note the size of the lock compared to the overall size of the pistol).